With a refined technique, unique improvisation, and a challenging and personal musical approach, Ernesto Llorens has earned a reputation as currently one of the most influential violin performers of Gypsy Jazz. 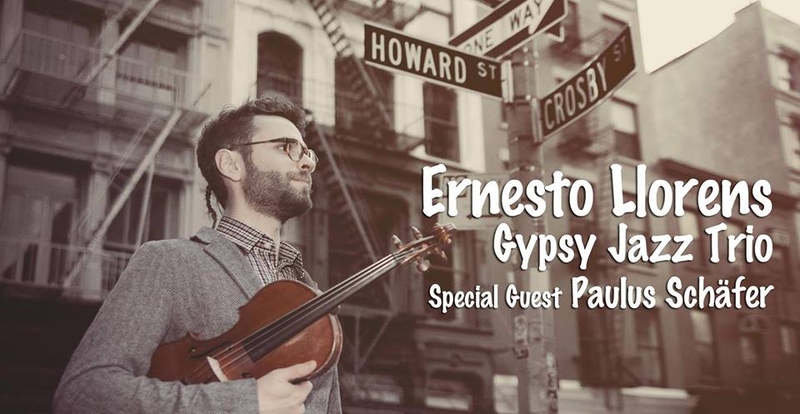 A jazz violinist and Spanish composer who lives in New York, Ernesto presents his new project Gypsy Jazz Trio, with the internationally renowned guitarist, Paulus Schäfer. Using Gypsy Jazz as his inspiration, Ernesto will perform his original compositions and works of the masters Django Reinhardt and Stéphane Grappelli, all accompanied by a solid rhythm section with Jorge Guzmán on the guitar and René Dossin on Double Bass. Paulus Schäfer (born 1978) is today one of the most talented Gypsy Jazz guitarists from The Netherlands. Born into a Dutch Sinti (Gypsy) community he learned to play the guitar at a very early age. Besides listening to fellow Sinti and records of his idol Django Reinhardt, it was Wasso Grünholz – a legend within the Sinti community – from whom he learned the most. After a short period of time, in which Paulus briefly took over the lead guitar of Jimmy Rosenberg in the Gipsy Kids, he formed the Paulus Schäfer Trio. Paulus has a particular sound, easy recognized, and although all Paulus’ albums are true to a distinctive Gipsy Swing Jazz sound; He is always looking for a new modern sound. Not only to broaden his own horizons, but also for a more representative Gipsy Jazz sound for the 21st century. Some highlights in the series of concerts of Paulus Schäfer: Sziget Festival Budapest (H), Khamoro Prague (CZ), IGGF Gossington (UK), Django Reinhardt Festival Samois-sur-Seine (FR), Gipsy Festival Anger (FR), International Gipsyfestival (NL), Kaluga Festival (RU), Djangofollies (BE), Djangoliberchies (BE), Djangofest (USA), Tampere Guitar Festival (FIN), Transform – Trondheim (NO), Amersfoort Jazz (NL), Haarlem Jazz (NL), Breda Jazz (NL) Jazz in Duketown (NL) to name a few. Being a musician on high demand, Paulus is often to be found on stage with other musicians like The Rosenberg Trio, Biréli Lagrène, Stochelo Rosenberg, Fapy Lafertin, Jimmy Rosenberg, Tim Kliphuis, Feigeli Prisor, Andreas Öberg, Olli Soikkeli, Gonzalo Bergara, Jan Kuiper etc. and can be found on many albums. He also recorded three albums with his own trio, his debut album Into the Light in 2002, in 2006 Desert Fire and Live at the NWE Vorst with the The Tilburg Big Band. In March 2012 he released Twelfth Year, in which he guaranteed the assistance of Tim Kliphuis, Nous’che and Stochelo Rosenberg. A few month later Rock Django with the violin player Tim Kliphuis. The album Kouvola Junction has been published in Finland in the same year. The start of a successful partnership with Olli Soikkeli and Arnoud van den Berg in the band Hot Club d’Europe. And in November 2014 the release of CD album Rocky with the accordionist Dominique Paats. Two new CDs are planned! Paulus also participates in projects as Five Great Guitars and Manouche Nouveau. Con una depurada técnica e improvisación singular, además de un enfoque musical desafiante y personal, Ernesto Llorens se ha ganado una reputación como uno de los intérpretes de violín más influyentes del Gypsy Jazz actual. El violinista de jazz y compositor español que reside en Nueva York, Ernesto Llorens, nos presenta su nuevo proyecto Gypsy Jazz Trio, junto al guitarrista internacionalmente reconocido Paulus Schäfer. Teniendo como influencia el Gypsy Jazz, interpretarán sus composiciones originales y obras de lo maestros Django Reinhardt y Stéphane Grappelli, todo ello acompañado por una sólida base rítmica de la guitarra de Jorge Guzmán y del contrabajo de René Dossin.